Starring: Kevin Kline, Michelle Pfeiffer, Calista Flockhart, Stanley Tucci, Rupert Everett, Christian Bale, Dominic West, Anna Friel, David Strathairn, Sophie Marceau, Roger Rees, Bill Irwin, Bernard Hill, John Sessions, Sam Rockwell. 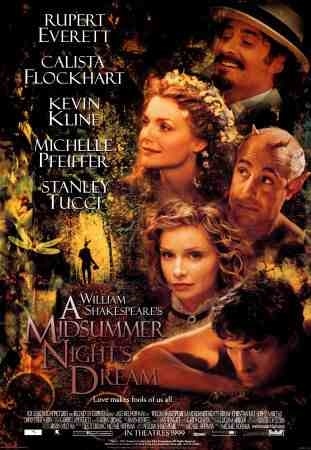 As a rule, I dont like to watch any William Shakespeare adaptations until I have read the play first. Having just finished reading this classic comedy/love story, I was eager to see it on screen like I am of any of the screen adaptations of his wonderful works. This however, isn’t as good as the great master deserves. While preparing for the wedding of Duke Theseus (David Strathairn) to Hippolyta (Sophie Marceau) a group of actors including Bottom the Weaver (Kevin Kline) rehearse an amature play for the forthcoming betrothal while forbidden lovers Hermia (Anna Friel) and Lysander (Dominic West) run away together, pursued by Demetrius (Christian Bale) and Helena (Calista Flockhart). 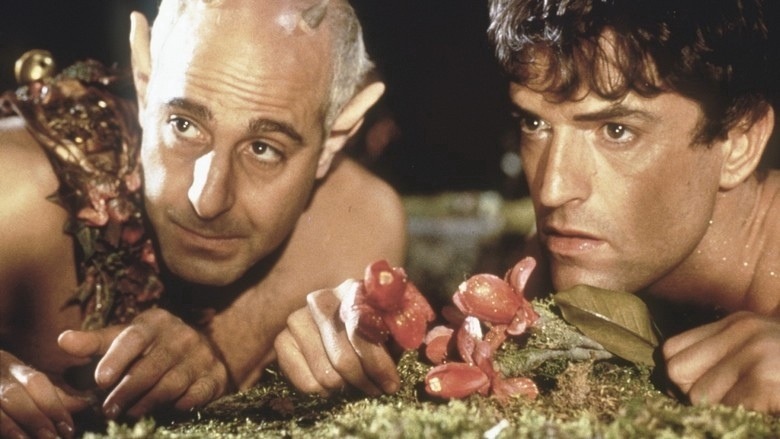 Meanwhile, in another part of the forest, Faerie King Oberon (Rupert Everett) wants to get at his wife Queen Titania (Michelle Pfeiffer). He dispatches malicious ‘sprite’ Puck (Stanley Tucci) on a mission to humiliate his Queen. En route Puck can’t resist messing with the mortals lost in the woods also, ensuring all sorts of confusion. Director Michael Hoffman’s take transports us from ancient Greece to late-19th-century Italy (complete with newly invented bicycles) and I have to say, it works. The sets and costumes are absolutely stunning, drawing you into the magical and mystical land of the faeries. He addresses it with the same playful tone that Kenneth Branagh captured for his adaptation of “Much Ado About Nothing” and also like that, uses the same mix of both American and British actors who are perfectly suited to their roles. It’s a lush and extravagant production, infused with Shakespeare’s humour but something doesn’t quite click. The mock Pyramus play at end is way overlong and almost grinds the film to halt. The only positive is that this is when the underused Sam Rockwell gets a chance to contribute something, but by then it’s too little too late. As David Strathairn’s ‘Theseus’ says around this time “No epilogue I pray you…” if only he’d said this 15 mins earlier, we could have had a satisfying ending. It’s classic Shakespeare that, shockingly, hasn’t had a decent adaptation yet. This is the best so far, but for fans of the great playwrite only. It captures the look but doesn’t quite capture the heart. This entry was posted on January 29, 2012 at 6:24 pm and is filed under Comedy, Fantasy, Romance with tags 1999. You can follow any responses to this entry through the RSS 2.0 feed. You can leave a response, or trackback from your own site. I found this movie fun and well performed, but I agree with you about it dragging near the end. It was good Vinnie but it was one of the more flimsier Shakespeare adaptations for me. I reviewed it recently actually. Would like to know your thoughts on it. Aah! Nice one! I’ll swing by when I get off work.